Judge to decide if jury will be allowed to hear national secrets. WASHINGTON – In what is stacking up to be one of the most decisive pre-trial hearings in the CIA leak case against I. Lewis “Scooter” Libby, the parties involved will face off Wednesday to argue which — if any — classified documents Libby will be allowed to use in his defense against charges of perjury and obstruction of justice. Libby’s legal gambit — threatening to reveal sensitive national security details when the trial begins in January — has the potential to derail the proceedings. 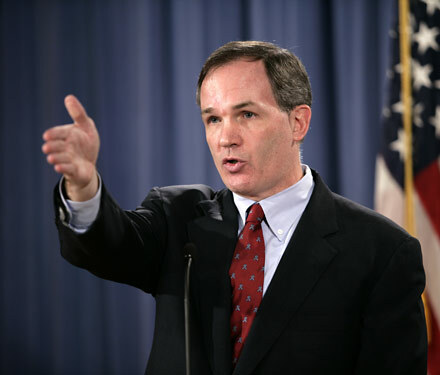 Attorneys for Vice President Cheney’s former top aide and for special counsel Patrick Fitzgerald will meet before Judge Reggie Walton on Wednesday in the first of several closed hearings dealing with classified documents. Judge Walton will decide the use, relevance or admissibility of the classified information. According to the latest Gallup Poll, more Americans blame President Bush than former President Clinton for the failure to capture Osama bin Laden. “According to a recent Gallup Panel survey, the American public puts the primary blame on Bush rather than Clinton for the fact that bin Laden has not been captured,” writes Lydia Saad for the Gallup News Service. In the telephone survey based on interviews with 1,010 national adults, aged 18 and older, which was conducted from September 21 to 24, before and after Clinton’s “heated” interview on Fox News Channel aired on Sunday, 53 percent blame Bush, while only 36 percent blame Clinton. Condi Rice turns into a man to defend Dubya. (Screen shot from the Boston Herald.) I guess someone at the Boston Herald has a sense of humor. WASHINGTON (AP) — New York Sen. Hillary Rodham Clinton has struck back at Secretary of State Condoleezza Rice in the escalating political bickering over which president – Bill Clinton or George W. Bush – missed more opportunities to prevent the Sept. 11 attacks. Clinton, D-N.Y., took aim at President Bush and Rice over their roles in 2001 before the attacks, part of a growing argument that ignited after former President Clinton gave a combative interview on “Fox News Sunday” in which he defended his efforts to kill Osama bin Laden. The senator was referring to a classified brief given to Bush in August 2001, one that Democrats say showed the Bush administration did not do enough to combat the growing threat from al-Qaida. When the brief was delivered, Rice was Bush’s national security adviser, and Clinton’s response was clearly designed to implicate her in the same criticisms that have been made of Bush. WASHINGTON, Sept. 26 — Three years ago, Secretary of Defense Donald H. Rumsfeld wrote a memo to his colleagues in the Pentagon posing a critical question in the “long war’’ against terrorism: Is Washington’s strategy successfully killing or capturing terrorists faster than new enemies are being created? Until Tuesday, the government had not publicly issued an authoritative answer. But the newly declassified National Intelligence Estimate on terrorism does exactly that, and it concludes that the administration has failed the Rumsfeld test.